Today, we will shed light on the most popular Magento extension produced by Aheadworks. 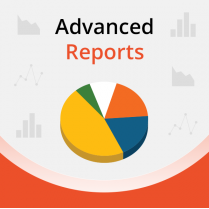 Advanced Reports is a perfect tool for arranging your data in a meaningful way and consequently making only informed decisions. If you are planning to reach a new business level with your ecommerce website, this Magento 2 reports extension is a must-have solution, and below we will describe all its features. It is also necessary to mention that the module is available for both Magento 1 and Magento 2. Interconnected reports data across Magento 2 entities. Sales Overview report. Use this Magento 2 report to monitor the overall sales number and calculate the general store performance. Product Performance report. With the help of this Magento 2 report, you can easily split total sales by product to find out the performance of each individual product with profit and margin calculation. Sales by Category report. Use it to split sales by category and find out the most profitable categories. Sales Detailed report. This one is designed to introduce a sales breakdown by item per customer. Sales by Location report. This report of the Magento 2 reports extension provides sales drill-down with such geographical parameters as a state, region, or city. Abandoned Carts report. Now, you can get the most precise report on cart abandonment without any third-party modules. The Aheadworks Advanced Reports extension includes it by default. With the report, you track abandonment rate statistics. Sales by Coupon Code report. You probably use coupon codes in your e-commerce business, so it is a good idea to monitor their performance. With the Magento 2 reports extension by Aheadworks, you can quickly get the number of orders and sales details resulting from coupons usage. Sales by Payment Type report. If you use multiple payment methods on your web store (by the way, we recommend you to add cryptocurrency payments), the Aheadworks module allows displaying sales data grouped by them. Sales by Manufacturer report. When you install the Magento 2 reports extension by Aheadworks, you also get the ability to group sales data by manufacturers. Sales by Product Attributes report. Any attribute or attribute combination may be used for creating a Magento 2 custom report. Traffic and Conversions report. This Magento 2 report introduces the ratio of unique page visits to placed orders and includes three interconnected reports: particular product performance, by period, and products in a period. Customer Sales report. You can even segment customers by the total sales for the specified period. Multiple segments may be used to cover new promotional campaigns. The Magento 2 reports extension provides intuitive charts that help users get a deep insight into what’s going on on the website. The charts provide the ability to reduce the time necessary for data administration and quick evaluation of each particular business situation. Magento 2 charts offered by the module are fully adjustable, so you can add as many parameters as you need to get the most detailed reports. The number of ordered items, tax, subtotal, discounts and other indicators may be included. Moreover, since each parameter has a color code, you will never miss valuable information because of an inconvenient user interface. Periods comparison is no longer a problem as well. 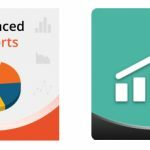 We compared aheadWorks Advanced Reports with competitors here: Magento 2 advanced reports comparison, and it was far from being the leader, but now the module has a quite comprehensive set of features. There are even chart markers that allow getting an overview of the corresponding reporting period by hovering over a marker. Besides, you can calculate profit and profit margin for each item you sell on your e-commerce website. The Magento 2 reports module by aheadWorks looks quite robust, so let’s make a little tour into its backend section. You can show/hide the available report parameters, change time intervals, set date ranges comparison, filter data by customer groups and store views, and view data in a grid. General extension settings of this Magento 2 reports extension allow selecting order statuses for your reports, as well as specifying price ranges to filter out data in the Customer Sales report and product attributes (Color, Format, Manufacturer, or Size) for the Sales by Manufacturer report. The Magento 2 reports extension is another time-proven solution which is extremely popular in the Magento community. It is the most demanded reporting solution which extracts and organizes data within your Magento storefront via 23 reports (in case of the first version of extension ). That sounds really great, but we should add that some of the reports should be purchased separately. The module costs $159, and each new report is $69. It is $690 for all additional reports (there are 10 of them). 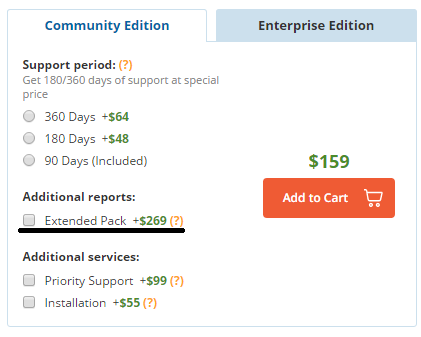 Luckily, Aheadworks offers an extended pack with all 10 add-ons for just $269. Thus, you will spend $428 for the full set of Advanced Reports features. Now, when we are done with the pricing, let’s highlight the most important functionality available with the module. First of all, you get a very convenient dashboard panel with Advanced Reports. The panel is equipped with all purchased reports, besides you can see a summary of key sales metrics there, for instance, an average order value for the last 30 days. Also, you can easily share all your reports via email. Moreover, it is possible to turn on automatic updates and specify their frequency. As for the user interface of Aheadworks Advanced Reports, it looks quite friendly. You do not need to spend much time trying to find the desired report since all available reports can be reached from a left menu. Also, you can seamlessly switch between reports with a single click. It is necessary to mention that some reports are now equipped with profit calculators. For example, “Sales by Product” or “Sales Detailed” provides the ability to evaluate profit margin contribution of each individual product on your Magento store. As for customization, the Magento 2 reports extension provides the ability to fine-tune each report according to your business requirements. Cart abandonment is one of the biggest headaches of e-commerce. Every merchant wants to decrease a current cart abandonment rate, and Advanced Reports can be extremely helpful in this process. When you implement an improvement, the extension analyzes the situation with cart abandonment on your website and shows how useful your enhancements were. Another vital aspect of the module is the ability to reduce the risk of running out of stock on trending products. You get a special report that makes predictions about how soon you will be out of stock by monitoring your purchase rate as well as remaining merchandise volumes. 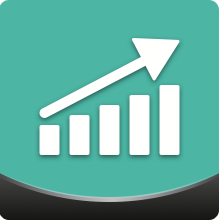 Sales Overview – your sales data on the chart for a pre-defined reporting period. Sales by Product – sales of each item available on your website. Provides the ability to compare products as well as search by SKU. Bestsellers – shows the most popular products for a pre-defined reporting period. Orders Detailed – time, date, shipping, financial, and other order details. Sales Detailed – various data on each ordered item. Sales by Hour – shopping activity fluctuations for 24 hours. Sales by Day – shopping activity spikes for a week. 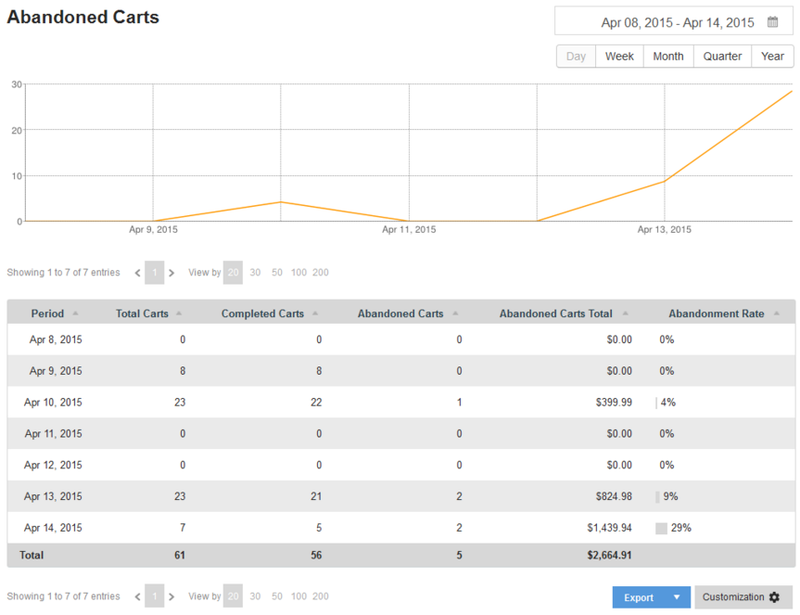 Abandoned Carts – the number of completed purchases, all abandoned carts with lost revenue, abandonment rate. Stock vs Sold – sales rate of a product and its stocks. Sales by Country – sales data for each country. User Activity – order placement, review writing, and other customer activities. Sales by Customer Group – sales data of each customer group. Products by Customer – the number of items in each order. These are quite useful reports, but what stats does the extended kit offer? Sales by Category – sales data related to a chosen category for a predefined time frame. Sales by Product Attributes – sales data grouped by chosen attribute(s). Sales by Manufacturer – sales stats for each manufacturer. 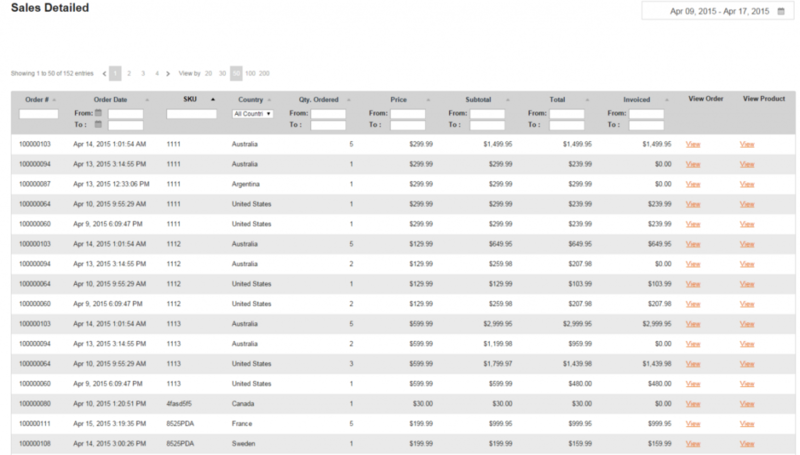 Sales by Payment Type – sales data for each payment method. Sales by Coupon Code – orders and other sales details affected by coupons. New vs Returning Customers – the ratio of first-time buyers to returning customers. Sales by ZIP code – sales data grouped based on ZIP code. Sales Statistics – average order amount + item price. Customers by Country – detailed sales data by each country. You can split it by each user, order, item, or financial details. Users Wishlists – products from the wishlist of your customers. These reports make the extension even more valuable. Of course, you might not need all of them, that’s why Aheadworks provides the ability to select only necessary options. The available basic reports provide the ability to evaluate general performance of your Magento 2 website from different perspectives. First of all, you get a complete sales overview that assembles core sales KPIs in a convenient table. Then, there is a report on product performance that breaks sales down by individual products. Other stats are gathered around categories, payment types, coupon codes, manufacturers, product attributes, location, abandoned carts, and traffic & conversions. As for report drill-downs, they provide the ability to combine several reports on one interface with responsive settings and a breadcrumb trail. As a result, the minimum time is required to adjust and navigate the reports. You can break any given period by such periods as day, week, month, quarter, or year. Furthermore, there is no need to return to Magento report selection for switching between reports since there is an appropriate drop-down menu. You can even contact support and access the module’s documentation right from the Magento 2 reports extension. Enhanced Reports Dashboard. 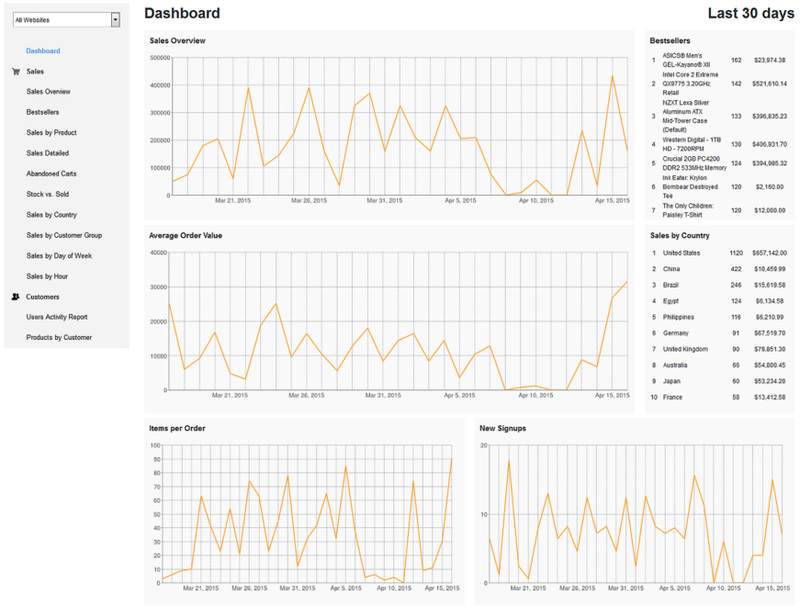 Now the dashboard includes 8 numerical widgets and 2 charts displaying diagrams. The content of each widget can be easily changed using the drop-down menu. Dual Y-axis Charts. Most of the charts get two axes: the one usually displaying monetary indicators, and another one – the number of orders, items ordered, conversion rates, and others. “Compare To” Functionality added for dashboard widgets, bar charts, and blocks with totals. Forecast Widget. The reports dashboard gets the new “Forecast: Total” widget, showing forecasted sales within a month in monetary terms and by items ordered. Additional Charts. Charts added to the following reports: Sales by Payment Type, Sales by Manufacturer, Traffic and Conversions, and Product Conversion. New Customer Sales Report. 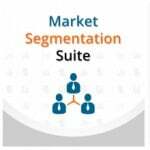 The report allows segmenting customers by sales ranges of money spent on their orders. It is also possible to go to a customer details page directly from the report chart. New Abandoned Carts Report. The new report provides cart abandonment statistics: the number of abandoned carts, total revenue lost, and abandonment rates. New Sales by Location Report. The report allows analyzing sales by states, regions, and cities. Data Comparisons. Advanced Reports 2.3 provides the ability to compare and display comparison charts for different time periods, including the ones set up by customers. Customer Group Filters. The implemented Customer Group filter allows building reports related to specific customer groups across the full set of the reports provided by the extension. 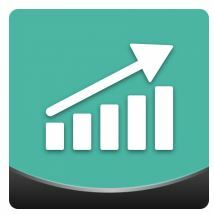 New Traffic and Conversions Report. The new report allows Magento admins to track sales related to the generated traffic and calculate average conversion rates for selected periods. This report includes three reports, in fact, available through the drill-down hierarchy. The first level describes the average data related to the whole store, the second level displays traffic and conversions divided by products, and finally, the third level shows traffic conversions and conversion rates dynamics for a particular product. New Sales by Product Attributes Report. The new report displays sales for different product attributes and attribute combinations. Profit and Margin Calculations and Records. Profit and margin related data are included in the Product Performance report. Report Bookmarks. Custom report views are saved in bookmarks for each individual user. New Sales Detailed Report. Reveals almost all significant parameters of sales, including multiple products and customer attributes, versatile totals, and more. New Charts. The new look of charts became more informative and visually attractive. Parameters are made in different colors and can be displayed simultaneously in one chart. New Grids. The extension uses native Magento grids with advanced filtering, sorting, and design management opportunities. Bar Chart for the Product Performance Report. The Product Performance Report takes advantage of bar charts. Performance Improvements, including Index Management. Advanced Report 2.0 is tested and approved for the stores containing up 200+ thousand orders due to the implemented performance improvements and own ad-hoc data index system. Aheadworks offers the most popular reporting solution for both Magento 1 and Magento 2. Though the second tool is a quite robust pioneer in the world of Magento 2 modules, the good old Magento 1 module is a time-tested and community-proven extension necessary for arranging e-commerce data on an average Magento website. With 13 standard and 10 extended reports, the tool covers the most crucial e-commerce aspects of every online storefront. Since the default platform does not offer the same opportunities, the importance of the module is obvious. As for Advanced Reports for Magento 2 with its 18 reports totally, the module also offers most of lacking features, so don’t hesitate to purchase and install it. The Magento 2 reports extension is already highly useful, and it will be even more reliable and full-featured after further updates.